Foreboding | Just Shooting Memories! Happy New Year!!! I can’t wait to see what new and exciting things 2012 will bring. Don’t forget to make it your New Years resolution to check here everyday for the photo of the day and I will make it mine to keep the work coming. Our visit was cold, cloudy and altogether interesting. The clouds during the drive to the battlefield were great and luckily for me, they remained fabulously photogenic. 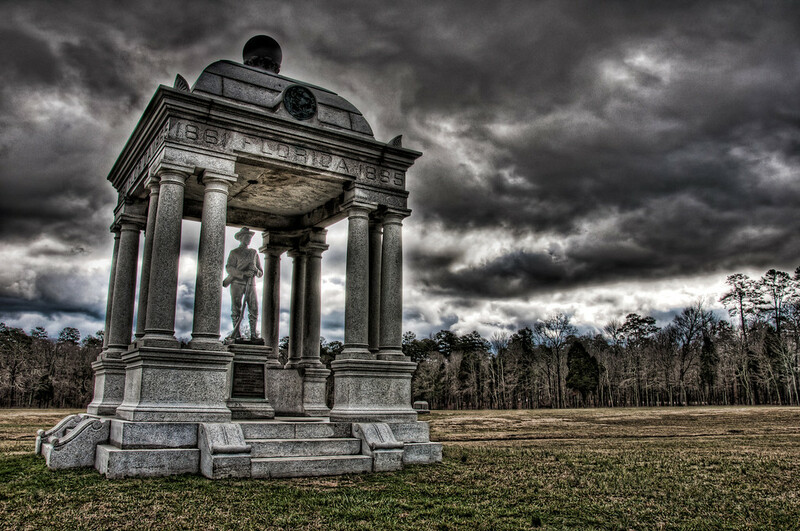 When you explore Chickamauga National Battlefield, you see monuments to all the states which participated in the battles. One of the first beyond the visitor’s center is the monument to Florida. I was able to snap this shot while there was a band of blue along the tree tops. It is not often that there are such dramatic clouds separated by such a blue sky. This battle marked the beginning of the end for the war, but at what cost?